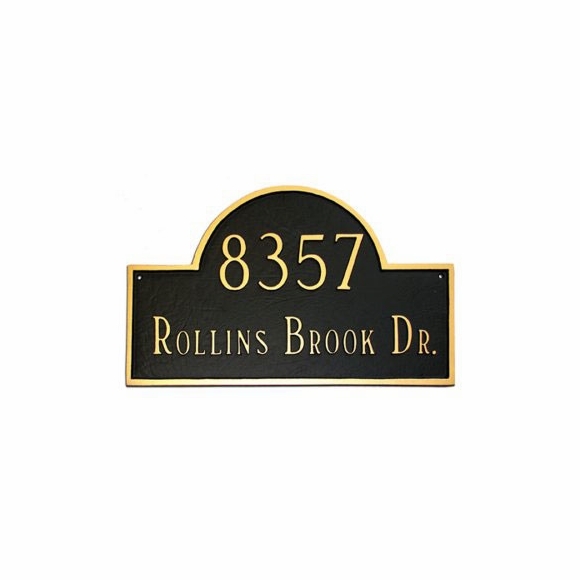 Personalized 2 Line Classic Arch Address Plaque - - Two-line traditional arch address sign holds up to five numbers on line 1 and up to seventeen (17) characters on line 2. Made in the USA. Sold in three sizes: standard 16.5"W x 10.5"H; large 20.5"W x 12"W; and estate 24"W x 14"H.
Standard arch holds up to five 3" numbers on line 1 and a maximum of seventeen (17) 2" characters (including spaces) on line 2. Large arch holds up to four 4" numbers on line 1 and a maximum of seventeen (17) 1.5" characters (including spaces) on line 2. Estate arch holds up to five 4" numbers on line 1 and a maximum of 17 characters (including spaces) on line 2. Characters are printed in large and smaller capital letters (see sample). Sign arrived on time and looks great in the front landscape area! an excellent product, looks good. Could not have made a better choice of product or company. This arrived as advertised. Beautiful plaque with the correct characters in the right place. So unusual today given other items I have bought on the web. Thanks!